Taken with pick 70 in the 1997 National Draft, Hoppner was a blonde midfielder who just couldn't get on the park in his time at Carlton. From memory young Hoppner had three successive shoulder reconstructions. When running around in the reserves, had some pace and a smooth passing ability. Just one of those unfortunate players crippled by injuries. 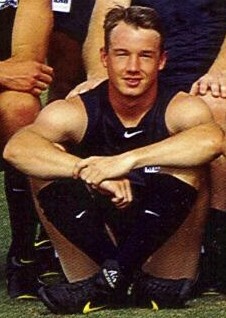 At 174cm and 72 kilos, Trent Hoppner played 8 Reserves games for 8 goals at Carlton during the 1998 season, between Round 3 to Round 11 and played his only senior game in Round 7, gathering six possessions in the 89 point loss to Port Adelaide at Optus Oval, Princes Park, while the Reserves had their second ‘Bye’. His best two reserves games during 1998 were in Rounds 5 and 6 when he was named in the Carlton’s best players and scored 3 goals in each of these matches, that were his only 2 victories for Carlton in 1998 against St. Kilda and Collingwood. He scored 3 of Carlton’s 7 goals in their one point victory against St Kilda. His other goals during this season were in Round 3 against Essendon and Round 10 against the Western Bulldogs. He missed the latter part of 1998 with a shin injury and the whole of 1999 with a shoulder injury, after which he was forced to retire at the age of just 20, prematurely ending what could have been a promising career. During 1997 as a ‘top up’ player, Trent played 6 reserve games for 4 goals for Carlton in #59, while he was playing in the TAC Under 18s competition with the Preston Knights U18’s side. He played for the Carlton Reserves in the first 3 rounds of the season and scored a goal in these first 2 games, he then played in Round 8 against Hawthorn when he was named in Carlton’s best players and his last 2 games were his only victories in Round 19 against Collingwood (when he scored 2 goals) and Round 20 against Geelong when he was again named in the Carlton’s best players. He played a total of 14 reserve games for 12 goals in 1997 and 1998. He was retained on Carlton’s list for 1999 but didn’t play any football. Hoppner wore guernsey No. 60 as a top-up reserves player for Carlton reserves in 1997. Separated his shoulder, performing chin-ups, in the CFC gym requiring surgery to a joint that had already recovered from a number of significant injuries; his career effectively ending on the spot. Despite having played just the one AFL game of football his desire to prepare his body regardless of the risks involved separate his achievement from those whose talent was greater but commitment far less. Contributors to this page: PatsFitztrick , Bombasheldon , molsey , tmd1 , Jarusa , DeanoSupremo , WillowBlue , BlueWorld , true_blue24 and admin . Page last modified on Thursday 17 of September, 2015 17:08:28 AEST by PatsFitztrick. 1982 GF - Fitzy & Parkin embrace after the siren. 1981 CH 7 Hall of Fame; Southby, Doull, Jezza & Barassi.